Green gram should be soaked in water overnight. 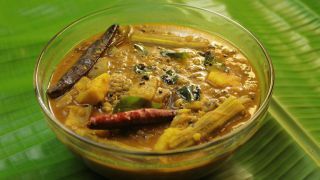 Cook the soaked green gram with all the vegetables, turmeric powder, pepper powder, salt and curry leaves and required amount of water. In another pan, add oil and splutter mustard seeds. To this add dried red chilies and curry leaves. Add this to the curry and serve hot.